A stunning & extremely rare surviving example of an original antique military aircraft seat. This fantastic aircraft seat once graced the interior of an Avro Anson military plane. 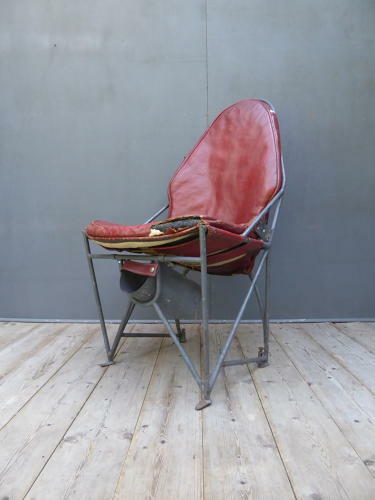 The lightweight tubular metal frame comes in its original painted finish & its original red leather upholstery, the cushions are stuffed with horsehair & the seat retains its original seat-belt. Research suggests this is an earlier model of the seat so one can only imagine what sort of War time action it may have seen! The Avro Anson was a twin engine, low wing cantilver monoplane produced from 1935 to 1952 & used by the RAF from 1936 & throughout World War Two. It initialy flew with a three man crew of one pilot, one navigator / bomb aimer and one radio operator / gunner though the RAF used a four man crew from 1938 onwards. It carried a .303 Vickers Machine Gun at the front end of the aircraft, a turret mounted Lewis Gun at the rear and an additional 360lbs of bombs could be carried between the two wings. A handsome piece of aeronautical salvage & fascinating piece of history which no longer turns up on the market very often. Wear commensurate with age, good original condition & displays beautifully. The metal framework has no breaks or cracks & the chair comfortably supports a good weight. The upholstery comes in original condition with several areas of wear & tear and the underside of the lower cushion has at some point been reinforced in three places which cannot be seen from above & does not detract.